Do I hear the blues a-callin', or is Kelsey Grammer exploring a Frasier reboot? Nobody asked us, but if Grammer’s still looking for pitches, here’s our take: Kids today couldn’t care less about Frasier beyond its meme status as an ancient sitcom with a memorable theme song. 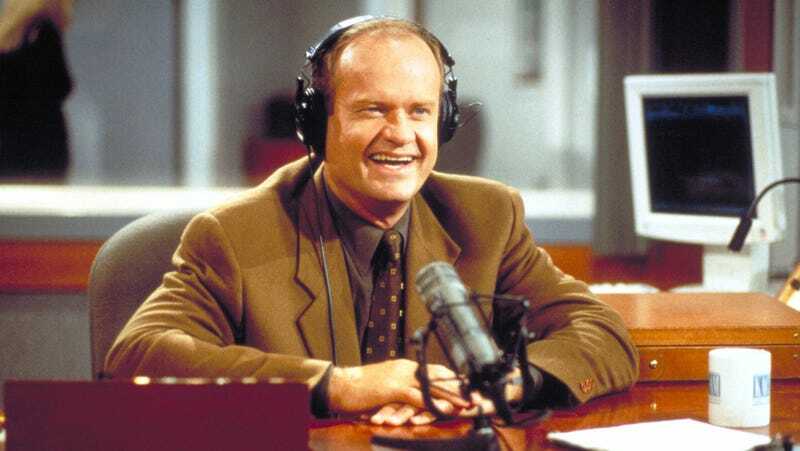 Therefore, in order to update Frasier for modern audiences, Grammer should lean into the show’s irrelevance and do a show about an aging Frasier Crane realizing that nobody listens to the radio anymore, so he moves to some hip city and starts a podcast with some cool millennials. He doesn’t get them, they don’t get him, but together they all learn a lot about each other (and also psychiatry). Give us a call, Kelsey. Seriously, what do we do with the tossed salad and scrambled eggs?